We operate the onshore Changbei tight-gas field under a PSC with PetroChina. The PSC was amended in July 2012 for developing tight gas in different geological layers of the same block. 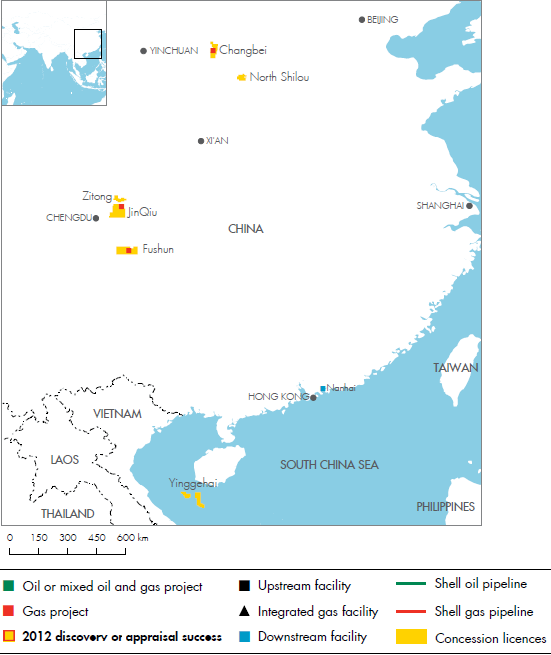 Shell and PetroChina have also agreed to appraise, develop and produce tight gas in the Jinqiu block under a PSC that expires in 2040 (Shell interest 49%), and signed a PSC in March 2012 for shale-gas exploration, development and production in the Fushun Yongchuan block (Shell interest 49%), both in Sichuan. Shell and PetroChina are also assessing opportunities in coalbed methane in the Ordos Basin. In 2012, Shell became a party to the Zitong PSC for tight gas exploration, development and production in Sichuan (Shell interest 44.1%). Shell has agreed with Chinese National Offshore Oil Corporation to appraise and potentially develop two offshore oil and gas blocks in the Yinggehai Basin under a PSC signed in July 2012 (Shell interest 49%).